Ask anyone what the best city in Australia is, and chances are they'll name their home city. Sydneysiders say Sydney, Adelaidians say Adelaide, and Melburnians say Melbourne. Presumably there's people out there who'll argue blind that their five-building one-street country town offers the best experience for visiting tourists. Well, as Melburnians, we've got a responsibility to back up our claims with solid evidence – or at least a totally subjective list of the best places for tourists to visit. It is a city worth visiting, after all. First is the Melbourne Museum, if only because of the glimpse it offers into our city's (and country's) history. Interstate visitors can check out the exhibitions about Victoria, currently including a series of images of Victorian beachgoers from a hundred years ago, and everybody can enjoy seeing the preserved body of legendary racehorse Phar Lap. The museum is open daily from 10am to 6pm, and an admission fee applies – check the website for details. Whether you like it or loathe it – and, if you're like most people, you'll loathe it – Federation Square sits both literally and metaphorically at the heart of Melbourne. The design is so ugly that it serves as a common punchline for jokes between locals, but despite that, its somehow been taken over as a genuine cultural hub. Even the logo is kind of ugly. There are a few busy bars there (check out Transport and Beer DeLuxe) and the main outdoor stage hosts everything from live music to showings of The Wizard of Oz, complete with retro deckchairs for the audience. Sure, it's an area of the city that could only be loved ironically – but, fortunately, we seem to be very good at that. If a person's true wealth can be measured in memories – and 'souvenirs' (which in French means 'memories') – then Queen Victoria Market is full of excellent bargains. There are tables and tables of authentic Australian trinkets: didgeridoos, miniature boomerangs, lockets and fridge magnets, all affordable and all identical. Pick up a handful of whatever you like, since it's the perfect gift for friends at home who pester you for holiday presents. Further back in the market are the food stalls, where you can buy anything from eco-friendly wine to plain old fruit and vegetables. In the middle you'll find live music and overpriced clothing, and the edges are ringed by cafés and donut stands. Check the Queen Victoria Market website to see when it's open, then come down and make a day of it. There's certainly no shortage of things to do and see. The Souther Star, immediately before its humiliating collapse. First things first: the Southern Star does not work. In fact, it may never work. There was a brief period at the very end of 2008 where it was operational, but structural defects caused the steel to buckle and crack, and they dismantled it for major repairs. Since then, it's been in the process of being rebuilt, with no definite end date. If, by the time you read this, it's in working order, then enjoy your amazing future ferris wheel. For the rest of us stuck here in the past, it's still well worth a look. And, given its size, you can look at it from pretty much anywhere in the city. A giant white skeleton is now a fixture of Melbourne's skyline, Ozymandias-like, a monument to the dashed hopes of its patrons and the hubris of its designers. We wouldn't have it any other way. 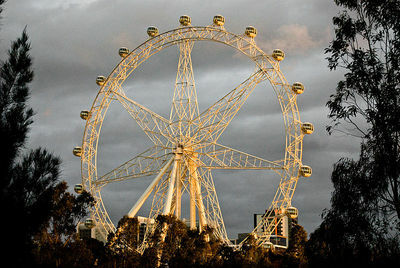 Know a Melbourne attraction that visitors would love? Whatever it is – except if it's the City Circle tram, which is awful – share it in the comments. We'd love to hear from you. Why? Because tourists should have good advice.